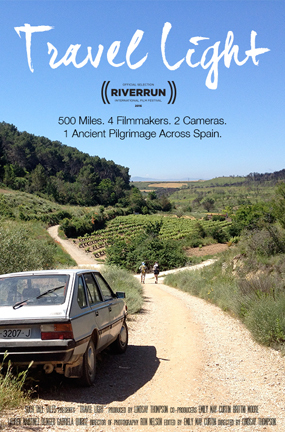 In “Travel Light,” a small team of young American filmmakers backpack 500 miles across Spain’s Camino de Santiago, attempting to capture not only their own experience, but also the intimate stories of the pilgrims who journey from all over the world to seek truth on the Camino. Director Lindsay Thompson—who will be on hand for a Q&A after the film—grew up in various cities across the East Coast. This taught her two things at a young age: that she loved to explore new places, and that nothing creates new friendships quite like being able to tell a good story. Lindsay attended UNC School of the Arts, where she studied Film Directing under Peter Bogdanovich and became fast friends with her fellow conspirators on this film. She graduated with honors in 2012. In addition to creating Travel Light, Lindsay pioneered the film program at The Arts Based School, where middle school students engage with filmmaking in their regular academic courses. The range of her students’ projects have included everything from avant-garde shorts adapted from classic poems to documentaries on Genghis Khan, Joan of Arc, and other key figures in the NC public school curriculum. In addition, “Seeking Sanctuary,” the first place student film from the 2018 NHDocs: New Haven Documentary Film Festival will be screened prior to “Travel Light.” This short film by filmmaker T.J. Noel-Sullivan follows the story of Marco Reyes, an undocumented immigrant who took sanctuary in a church in New Haven.